We've teamed up with the Best Western Forest Hills Hotel in Frodsham, Cheshire to offer our One Day Wine Course which you can attend just for the day on a Saturday or with an overnight stay to make a weekend of it Weekend Wine Tasting Break. The Saturday tasting lasts from 10.30am to 4.00pm with 16 wines and a 3 course lunch. Its a great opportunity to learn about wine in a relaxed and informal setting with like-minded wine lovers. The day is good fun all round as well as being educational and great value for money too. We can also host a private wine tasting in your home for groups of 10 or more and we can provide corporate wine tasting events at various other Cheshire venues. If you are buying this as a gift you can purchase the One Day Wine Course as an open-dated gift voucher so that the date can be booked with us after your gift has been received. We'll automatically email you a link to the voucher to print out or we have printed gift vouchers that we can post to you or the gift recipient for £2 (select on check out). Join us for a day of wine tasting, with 16 wines to taste and a delicious 3 course lunch. All of our One Day Wine Courses are run on Saturdays, starting at 10.30am and finishing at 4.00pm. Numbers are restricted to a maximum of 18 so there is plenty of opportunity to get to know other attendees and ask questions. 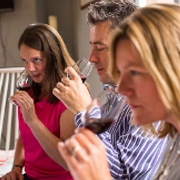 The tasting is perfectly pitched at budding wine enthusiasts, from beginners to those with a bit more knowledge, so that everyone will get plenty out of the day. You can make it a weekend break with an overnight stay on Saturday night, dinner and breakfast plus the One Day Wine Course at £159 all inclusive based on two people sharing a double room, see Weekend Wine Tasting Breaks. Not found what you are looking for? Register your interest in attending a wine tasting event in Cheshire by completing the form below. Once we have a sufficient number of people interested in attending, we will contact you with potential dates and venue details. If you have any questions or would like to book over the phone, please call us on 020 8288 0314 or you can contact us by email.